Digitising flowers is a tremendous challenge. As I grow lots of flowers in my garden with the purpose of transforming them into embroidery, I realise how difficult it is to capture their beauty in stitches, which are just very small lines. It is easy to create a satin petal and then create a flower by grouping four, five or six of them together. I try to aim at more than that, although those type of flowers make excellent fill-ins. There are at least two ways to digitise flowers, flat as though you are looking at them from above, and in a more natural way, getting as close as is possible to the real thing. 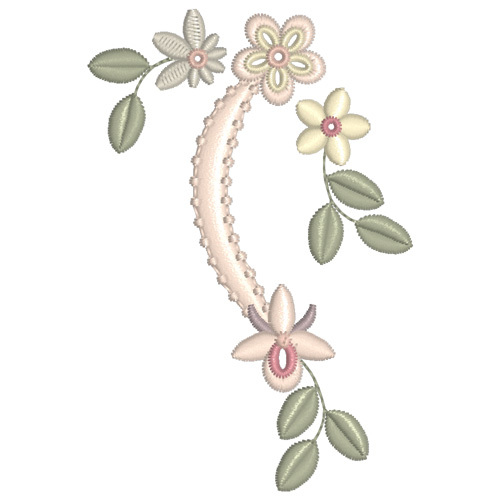 I was deciding on the final colours to use in my Beatrice collection, when I was struck how ordinary some of the flowers were, and I decided to digitise some more small delicate orchids so that the collection is more than just pretty. 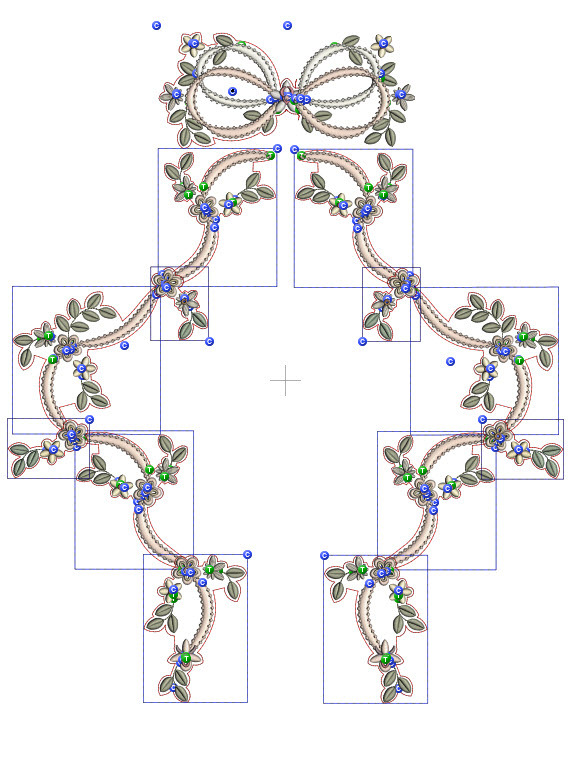 After all if these designs are to be stitched out in silk thread they need to be more than ordinary, don’t you agree? I have replaced several of the flowers with these little orchids. It would be impossible to capture every detail of any orchid in flowers this size, so I have focused on the important shapes which are unique to them. There are quite a few colours in these designs, twelve in all, although most of them are very similar, my usual neutral tones. 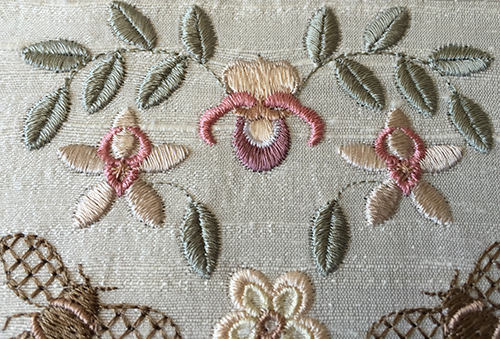 Subtle colour shades and tones bring life to your embroidery and it is best to avoid the use of primary colours. I found this a lovely soft thread to use, and had no breakages at all in my stitch outs. Silk also creates very little lint unlike some other threads. Although more expensive I thought it worth the extra cost, and will be using it again for my designs as it is so vibrant. In finishing off the first set of designs, I have also created several delicate satin ribbons with a pretty notched edging. 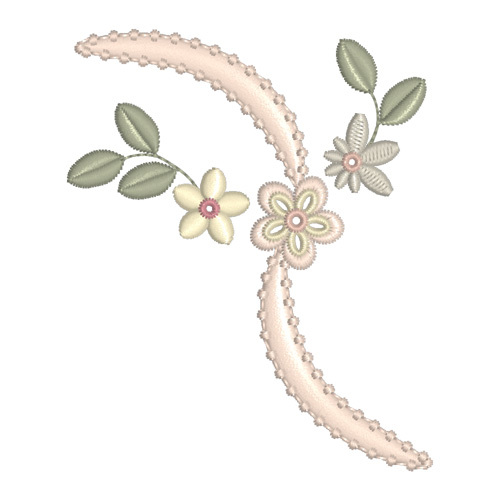 These ribbons can be used to join clusters of embroidery which is often required on heirloom items, creating a unique shape. There is an option for stitching edges of the ribbons in a different colour. 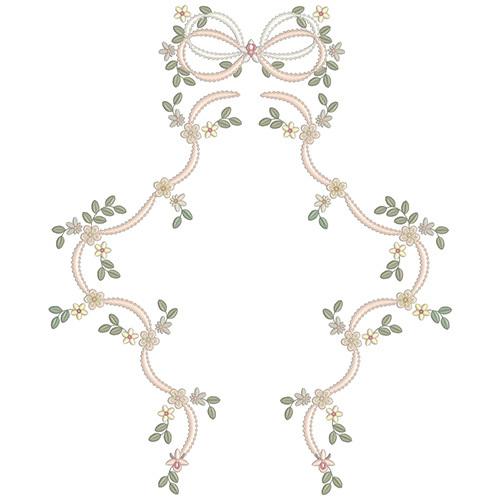 There is also a two part bow that can also be combined with these designs. It will be available as one design in the second set for 5″ by 7″ hoops. These 3 images show you how to combine the 2 sections of the top of the bow if you only have a 4″ by 4″ hoop. Use the Outline alignment stitches of GFE-BEA-1-23 on hooped stabiliser to accurately place it alongside. There will be other designs in the future sets that you can use to create your own heirloom combinations. However here is one that I put together below the combined bow. Without the Outline alignment stitches you get to see the beauty of the combination. Just an idea quickly put together featuring some of the 32 designs from Beatrice 1. 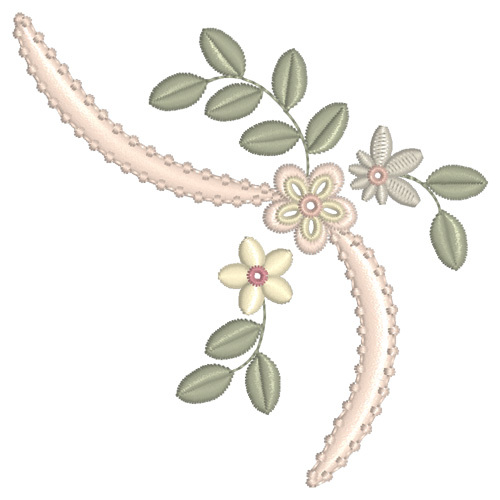 I nearly forgot to say that there is a freebie from this collection, for you to test out, so please email me at hazel@gracefulembroidery.com if you would like it test. You can use it to create an endless border. 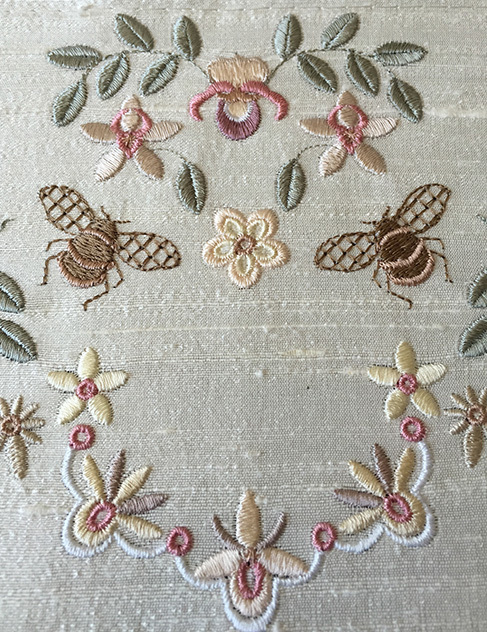 This entry was posted in Discussing machine embroidery and tagged colour changes, development of embroidery, Digitising flowers accurately, life like flowers, silk thread embroidery, The importance of colour. Bookmark the permalink. Hi Hazel, I really enjoyed your tutorial in how to make a design not only beautiful but unique. 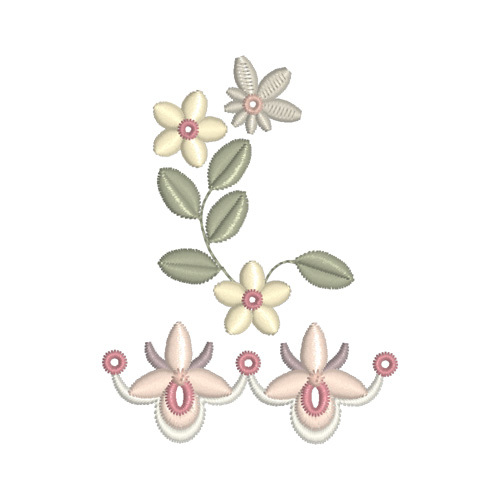 I did not realize that there were two ways of digitizing flowers, which is probably why your flowers always seem to have a 3 D effect. I like the little eyelet type designs that you interject throughout your designs as they provide the perfect place for pearls or other jewels adding even more elegance to your already elegant designs and and gives us a change to display our creativity to your designs..